A Rio Carnival atmosphere will descend upon Disneyland Paris this weekend when The Disney Village plays host to Fiesta Latina. Parades will liven up the street of the Disney Village with brightly costumed dancers and percussionists amidst a Brazilian-coloured party atmosphere. Between the 4-6 June 2010 guests will be able to enjoy a weekend of Samba music, dancing, and entertainment. There will be a Brazilian parade featuring Batucada and Bahian street-dancers, together with performances of Samba, Kizomba and Capoeira dancing. During the festival guests will also be entertained by performances of Salsa, Bachata dancing, and they will be able to take part in Cuban Tango lessons and concerts at Billy Bob’s Country Western Saloon. 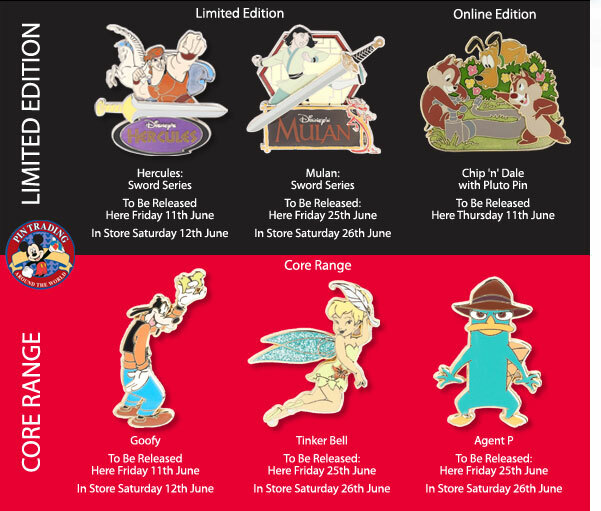 Here is the round up of Trading Pins scheduled to be realsed by the Disney Store in June. The Sword Series of Limited Edition pins continues with Mulan and Hercules. This months Online Edition pin features Chip ‘n’ Dale with Pluto. Core Pins to be released this month include Goofy, Tinker Bell and ‘Agent P’ the semi-aquatic, egg-laying mammal of action! AKA Perry the Platypus from Phineas & Ferb. 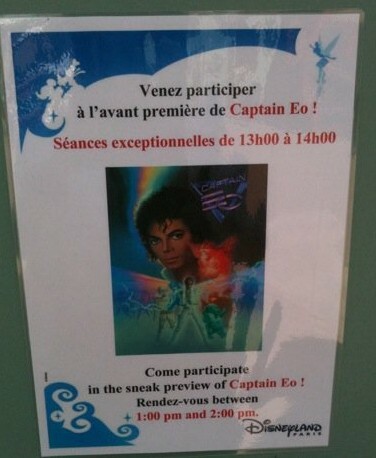 Yesturday Disneyland Paris hosted a sneak preview of Captain EO, the 3D film starring Michael Jackson which was directed by Francis Ford Coppola with George Lucas as executive producer. 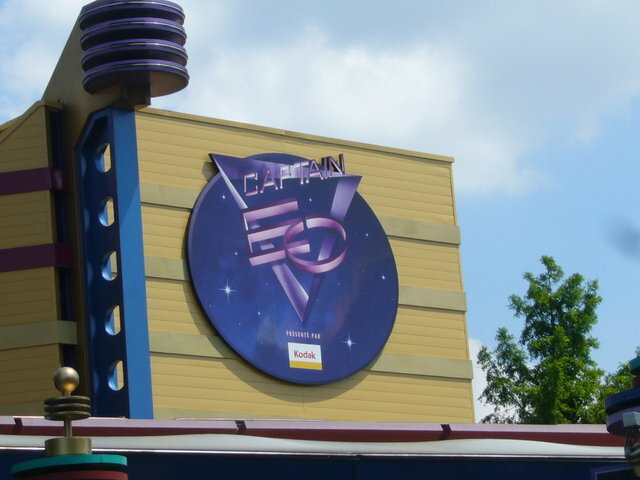 Captain EO was originally shown at Disney theme parks in the 1980s and 1990s. The attraction returned to Tomorrowland’s Magic Eye Theater at Disneyland in Anaheim on 23 February 2010 for an indefinite engagement. Captain EO is also returning to Tokyo Disneyland on 1st July and Walt Disney World on 2nd July. Captain EO has replaced Honey, I Shrunk The Audience! at the Imagination Theatre in Discoveryland and will officially open on the 12 June. Will the Sleeping Beauty Castle be refurbished this Christmas? This week rumours of a possible refurbishment of Le Château de la Belle au Bois Dormant appeared on the internet. The rumours which surfaced on the MagicForum discussed the possibility of a full refurbishment of the Disneyland Paris castle during this years busy Halloween and Christmas seasons. If true this will be only the second time that the Sleeping Beauty Castle has been fully refurbished. 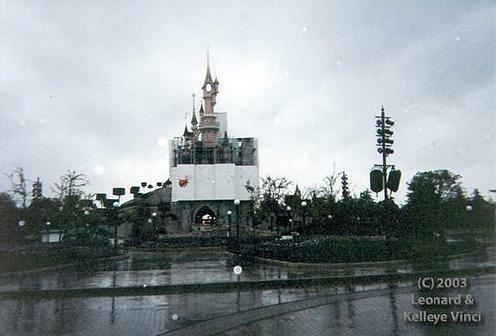 The first was in 1998 after the removal of the 5th Anniversary Festival of Fools castle makeover decorations. There was also a rumour this week that Disney’s Sequoia Lodge Hotel will have a complete refurbishment from top to bottom with everything being ripped out and replaced. More interestingly, a plan exists that will turn the Sequoia Lodge into Europe’s first fully ecological hotel. Disneyland Paris is seeing a lot of activity this year in advance of the resorts 20th Anniversary in 2012 with Toy Story Playland in Walt Disney Studios scheduled to open on the 17th August. Meanwhile over in the Disney Village preparation for the arrival of the Earl of Sandwich resturant and the World of Disney store are both well underway. 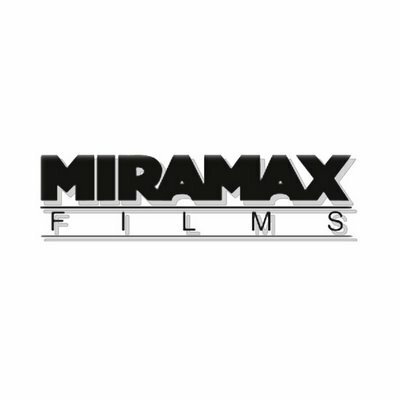 Weinsteins confirm $625m bid for Miramax Films. The Weinstein brothers were on Saturday forced to confirm publicly that they were still in talks to buy Miramax following reports that the deal had fallen apart. For months, Bob and Harvey Weinstein have been in negotiations to buy the film production company from Walt Disney for $625m (£432m). They had lined up financing for the long-planned deal from a group of high-profile investors, including Ron Burkle, the supermarket mogul, and hedge fund Fortress Investment Group. However, over the weekend the Los Angeles Times said the deal was off because of complications over how Miramax would be integrated into the Weinsteins’ existing company. The US newspaper also claimed Mr Burkle, who had planned to put in $300m of his own money and was expecting to raise the balance, was unable to come up with enough money to satisfy Disney. Disney has been looking to sell its Miramax unit as it views the production house, with its edgy mix of films, as a poor fit for Disney’s family-friendly business focus. Before Disney entered into talks with Mr Burkle and the Weinsteins, it is believed to have received a $650m offer from embattled film executive David Bergstein. Disney is also thought to have received a $550m offer from the respective firms of financiers Alec and Tom Gores. 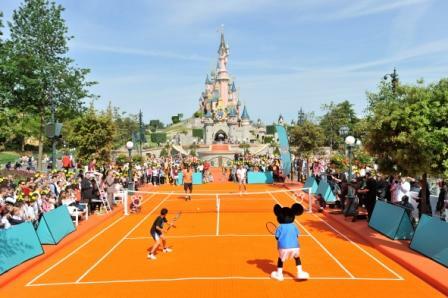 Disneyland Paris is being considered as the new home for the French Open. Disneyland Paris is being considered as one of the new possible homes of the French Open. Marne-La-Vallee is just one of the locations for the new home French tennis Gilbert Ysern, general director of the French tennis federation, told a news conference on Saturday. The relocating of the clay-court Grand Slam from Roland Garros is being considered because it needs more space to remain competitive with the three other major tournaments. A second potential destination covers 148 acres in Versailles, where the French army is vacating a military base next month. The third site under study, Ysern said, is smaller, 74 acres, in an area northeast of Paris called Gonesse. The French Open has been at Roland Garros since 1928 and the federation has a contract there till 2015. The French federation assembly is expected to make its decision in February. Henin accepted that space is an issue at Roland Garros, but said its tradition is one of the French Open’s main assets. Among the Grand Slam tournaments, only the French Open and Wimbledon have never been moved. While Wimbledon has been updated, facilities at Roland Garros have become outdated. The lack of space for 450,000 annual spectators, players, journalists and sponsors is a problem, while the absence of covered courts leaves the tournament vulnerable to the weather. The French Open’s facilities are spread over 21 acres, while Melbourne Park — the site of the Australian Open — and Wimbledon each have 49 acres. Flushing Meadows, site of the U.S. Open, has 34.5 acres. Jo-Wilfried Tsonga said there is only one Roland Garros. “I would prefer to stay here and make the tournament bigger here because this site is wonderful,” Tsonga said. If the tournament stays in Paris, three adjoining areas will be added to Roland Garros at a cost of about $251 million. Building a new stadium outside Paris would cost an estimated $754 million. Versailles castle is 12 miles from downtown Paris. Disneyland Paris in Marne-La-Vallee is 30 miles from the French capital. Should the tournament be relocated, preliminary designs envision a 74-acre site with 55 tennis courts — two with a retractable roof — that would be able to receive up to 60,000 people a day. Disney Store Launches Magical New Store Design in Major Markets Across the U.S. and Europe in Summer 2010 Worldwide Unveiling of New Design in Montebello, CA and European Premiere in Madrid, Spain. Disney Store is poised to redefine children’s retail, launching a magical new store design in major markets across the United States and Europe this summer. The innovative Disney Store design will be unveiled for the first time in June at The Shops at Montebello in Montebello, CA just outside of Los Angeles, followed by the European premiere in early July in Madrid, Spain at La Vaguada. A unique destination developed from a child’s perspective, the new store design integrates the latest technology to create an enhanced shopping experience inspired by Disney’s most popular characters and stories. More than 20 new and remodeled Disney Store locations are slated to open this year in premier retail centers throughout North America and Europe. North American locations have been confirmed for Roosevelt Field Mall in Garden City, New York; Santa Monica Place in Santa Monica, California; International Plaza in Tampa, Florida; Stockton St. in San Francisco, CA; and Fashion Valley in San Diego, CA. European locations cover four markets with openings in Spain, Portugal, Italy and the UK. These include NorteShopping in Oporto, Portugal; Orio Center in Bergamo, Italy; and UK locations including Centre MK in Milton Keynes, Bon Accord Centre in Aberdeen and Donegal Place in Belfast. Each new store has special significance and will be celebrated as an important milestone in Disney Store’s growth and evolution. Roosevelt Field will be the first east coast newly-designed store to open in the United States. In August, Disney Store will join a group of exclusive retailers for the re-opening of the new Santa Monica Place shopping center near the legendary Santa Monica Pier in southern California. Santa Monica Place is a modern shopping and dining destination that combines contemporary styles with sustainable architecture, and Disney Store will offer a comprehensive assortment of unique Disney products to the elite clientele. Disney Store at International Plaza in Tampa, Florida will be nearest to Walt Disney World Resort, allowing families to visit both this summer. Fashion Valley brings together San Diego’s finest collection of stores set in a beautiful outdoor shopping center, and the newly-designed Disney Store will launch there this summer. Disney Store will join retailers in the historic Union Square of San Francisco, one of the largest shopping areas in the United States. Union Square became San Francisco’s shopping epi-center in the early 1900s and today, upscale stores and hotels surround Union Square, and shopping extends blocks from the central plaza. In Europe, Oporto will be the first Disney Store to open in the north of Portugal and only the second to open in the country, following the successful launch of the brand to the market in 2007.